Here are the tips and tricks you need for grilling your bird to perfection. Chicken is done when it reaches an internal temperature of 165F. Measure temperature in the thigh but be careful not to touch the bone. If you don’t own a meat thermometer, cut open the center of the thickest cut of chicken to see if the juices run clear. Turn chicken breasts halfway through grilling. Turn other cuts of chicken two to three times. A cut-up broiler or fryer chicken weighing 3 to 3 ½ pounds will generally need 35 to 40 minutes to cook. Bone-In or split chicken breasts usually weight 2 ½ to 3 pounds and will need 20 to 25 minutes to cook. Boneless, skinless chicken breasts usually weigh 1 ¼ pounds and take 15 to 20 minutes to cook. For breasts or any cut of chicken that takes 25 minutes or less, it’s best to use direct heat when grilling. This simply means that food is cooked on the grill rack directly over the coals or heat source. For whole chickens and other cuts that take longer than 25 minutes, it’s best to use indirect heat when grilling. If you are using a sugary or tomato-based sauce, it’s best to brush on during the last 10 to 15 minutes of grilling to prevent burning. Boil basting marinades, (used when preparing meats), for 1 minute before serving. Better yet, set aside some marinade to use for serving, and discard marinade used for basting. 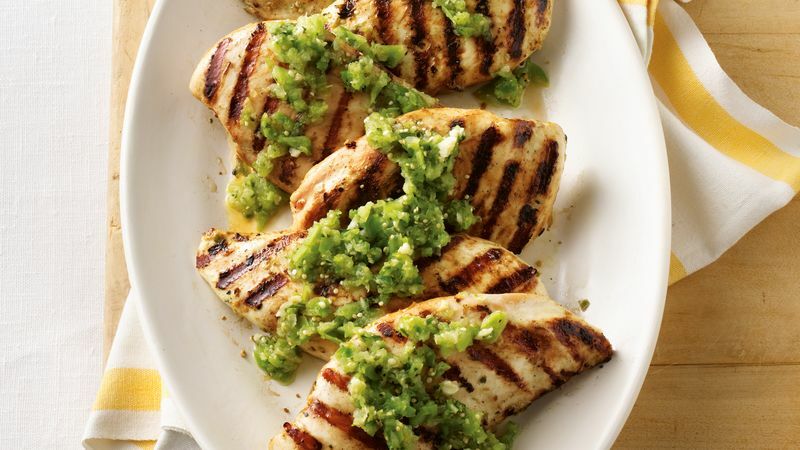 And if you need another delicious reason to grill tonight, search the rest of Betty’s best grilled chicken recipes.